At its June meeting, the TMWA Board of Directors unanimously voted to name Vaugh Hartung as chairman and Ron Smith as vice chairman of the TMWA Board of Directors for the fiscal year starting July 1, 2018. 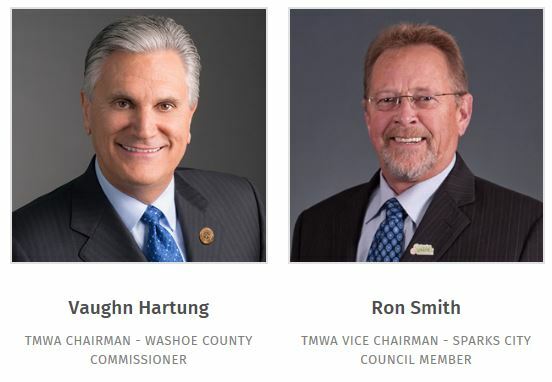 Hartung serves on the Washoe County Commission, and Smith is a councilman from the City of Sparks. Outgoing Chairman Geno Martini announced his retirement at the meeting. Martini also recently retired as Mayor of Sparks. Hartung was nominated for the chairmanship based on his fellow board members’ favorable view of his management of board meetings during Martini’s absence for health reasons over the last year. Kristopher Dahir was appointed by the City of Sparks to fill Martini’s seat. “We have had some tremendous board members over the years, but few have made a contribution that equals Mayor Martini’s,” said Mark Foree, TMWA’s general manager. “His level-headed, deeply informed approach to policy has helped establish TMWA as a model of public sector effectiveness and efficiency. For both his work as Mayor of Sparks and as a member of our board, our community owes Mayor Martini a real debt of gratitude,” Foree added. TMWA is a not-for-profit, community-owned water utility, overseen by elected officials from Reno, Sparks, and Washoe County. Also serving on the TMWA Board of Directors are Jenny Brekkus, Naomi Duerr, and Neoma Jardon from the City of Reno and Bob Lucey from Washoe County.